A suspected drunk driver is in police custody after striking and seriously injuring a motorcyclist on south Whidbey Island on Thursday, according to the Washington State Patrol. Reports state that the driver of a Jeep Cherokee was traveling north on Highway 525 when it veered across the center lane and into oncoming traffic. The Jeep crashed into the motorcyclist approaching from the opposite direction. The motorcyclist was a 46-year-old man. His BMW motorcycle was totaled. He was airlifted to Harborview Medical Center in Seattle with serious injuries. The driver of the Jeep was a 59-year-old woman. She was not injured. According to reports, she was booked into Island County Jail on suspicion of DUI and vehicular assault. Motorcycle operators are obviously at a greater risk to injury on roadways. They have less protection passenger vehicles do – complete with airbags, anti-lock brakes, and seatbelts – and their passengers are at serious risk in the event of a crash. The Centers for Disease Control and Prevention has studied the injury rates in motorcycles over the years, and the numbers aren’t all that surprising. Approximately 30 percent of all non-fatal motorcycle accident injuries occurred in riders’ lower extremities. Nearly 22 percent of injuries occurred to the head and neck region. Motorcycle accident victims who were wearing a helmet at the time of a collision had a higher number of minor injuries and a lower number of severe injuries. In 2016, there were 2,264 motorcycle-involved crashes in Washington State. Of those accidents, 363 involved serious injuries, while 77 were fatal. Neck and head injuries: These types of injuries are likely to be life-threatening. A traumatic brain injury (TBI) can be sustained, and the recovery time is typically very long. Upper torso injuries: While motorcycle jackets are designed to prevent or reduce the harm of these injuries, they can still be devastating. 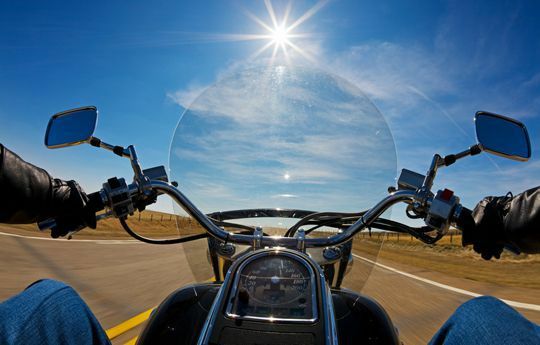 Arm, hand and finger injuries: Motorcyclists extend their arms and hands when bracing for a fall after a collision. This can result in a lot of damage. If you or someone you know has been seriously injured in a motorcycle accident in Washington state, contact Davis Law Group, P.S., at (206) 727-4000, use the chat feature below or the contact form on this page to discuss your case for free. 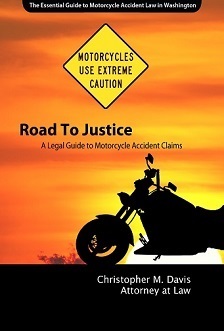 Get your complimentary copy of "Road To Justice: A Legal Guide To Motorcycle Accident Claims" absolutely free by clicking the "Order Now" button below.Award-winning motorcycle accident attorney Chris Davis has written a series of FREE books, including one about motorcycle accident cases in Washington state. These books answer common legal questions that people and their loved ones may have about their legal rights, including how to handle your claim on your own and when you might need an attorney's help.